Surprising enough we have made it to our final destination. We are at Zancudo Beach on the Southern Pacific coast of Costa Rica. I am in shorts drinking an Imperial beer in the beach cabina. I have wireless access. Talk about ubitutous computing. This is it. We flew standby on two flights including the flight from San Jose to Golfito. We didn't even get boarding passes. We handed over another 30 bucks and were escorted to the single engine Cessna without a lot of red tape. After we got off in Golfito we grabbed a cab to get to the dock (surprised we made that connection) then after a half hour boat ride landed in downtown Zancudo. 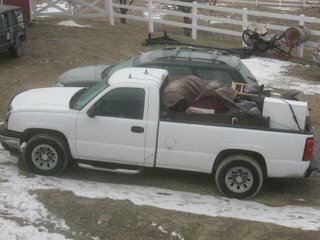 Another 15 to 20 minute truck ride down the only street. We arrived in paradise. You may have heard already that paradise is not perfect, but that is another story. We almost ran over an iguana (Basilisk) about 3 foot long on the road. There are waves of defining sounds of insects like cicuadas. I mean it can get really loud when all the little buggies go at once. Audio file will follow. We made it as far as San Jose Costa Rica today. We missed a flight so we are a day behind. This gives us a nice opportunity to check out San Jose for a night anyway. Maybe a bit more when we leave country. It is about 80 degrees with a stiff breeze. It was a bit of fun getting a hotel with the driving around and checking a few out using pidgeon Spanish. There are a couple of large international hotel chains, but most are local owned and run. The prices are generally reasonable. If you want to spend a lot you can spend a lot, however. We are (of course) staying at a locally owned hotel, "Hotel El Rodeo." The service so far has been very good. It is almost time to get a drink. Today was Florida. I got to visit with my Mom in her new home. She seems ok. More travel today. From Orlando to Miami to San Jose then to Golfito where we take a taxi and a boat. It has been a while. I have fallen behind on many activities. I made another trip to my Mom's place in Rochester. This time I left the trailer at home. I am getting the place ready to rent. Property always looks worse when it is empty. You see defects in the paint and the carpet and all that. I will be headed back up in a couple of weeks to help Jeff get the place in shape. I am being very choosy on tenants. If there is one thing I have learned about being a landlord it is that the focus needs to be on high-quality tenants. 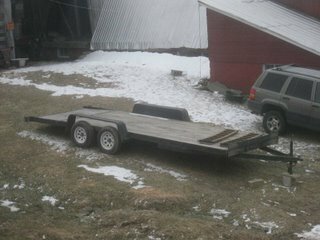 I am a bit surprised how much use I have been getting out of the trailer even in the winter. I moved a Jeep for Douglas the other night on top of using it to move my Mom's stuff. My house capacity is near maximum. I literally have boxes stacked to the ceiling in the basement. When warehouse space gets over 70 percent to capacity (or so) efficiency is greatly diminished (interesting tidbit of information). It is a bit depressing. 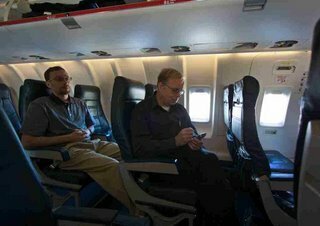 The pic of me and a coworker on the plane was taken by my boss a while back. I thought it was an unusual picture. We really don't take pictures like this in our busy lives. 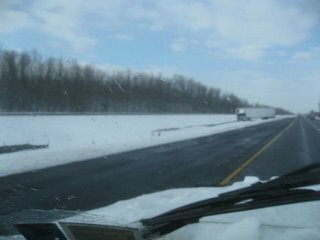 The trailer truck spun out in median was the only wreck pic I have captured lately. I saw a few more. Today's list is packing for Costa Rica, burning trash, paying bills, empty truck, organize office and a few other things. We are leaving for Costa Rica Wednesday. I am taking dog biscuits for our host Karen. Her dog misses them.